A3 Size 10.7 x 10.7 in. 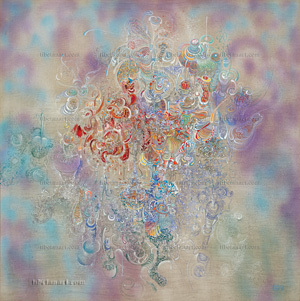 This early square painting was made in 1976, and is relatively quiet in its soft and amorphous form. The raw brown Irish linen canvas has been lightly sprayed with blue and grey aniline dye, and the ethereal shapes of John's archetypal and calligraphic structures begin to appear in the outer areas of the composition. These structures become more solid and colourful towards the centre, just as thoughts seem to coalesce and assume transitory forms as they emerge from the empty landscape of the mind, like clouds forming and moving across that infinity of space that we call the sky. "Synaestesia" means the overlapping of the senses, e.g. 'smelling' sound or 'hearing' colour. All of my paintings for the last seven years have had the word synaesthesia prefixed to the title, on the basis that every experience (visual or emotional) is an aggregation of all the senses. My early work required nature as a direct stimulus, and markets and beaches provided much of the subject matter. In retrospect I realise that I did not go to the market and sit drawing on an orange box simply to record external reality. I went there compulsively, like a moth flying towards the light. The moving flood of people, together with explosions of colour from the fruit and flower stalls, became a kaleidoscope which mirrored cosmic energy; and I found this the nearest equivalent in external reality to meet a growing inner need. Over a period of years this constant bombardment began to distil into a residual flow, which re-emerged in my paintings as a completely expressive colour language. The momentum of this formative process increased when I discovered that my relationship with life around me had thrown up universal primordial symbols that had a strong link with the collective unconscious. The reality and meaning of existence only reveals itself to me as 'in between the lines' experience. The lines are meaningless, only the emotional aura given off from them counts. The real core of life only presents itself in the emotional residue left wedged in between the lines of what actually happens. If you live a life without emotion you will gain freedom. You will in fact be imprisoned in your freedom. I have been 'freed' into an eternity of emotional imprisonment. The inner sanctum is, however, closer to the hub of the universe. Or fade the colours of the mind. Only truth can be permanent. Can transcend time and give permanent life.